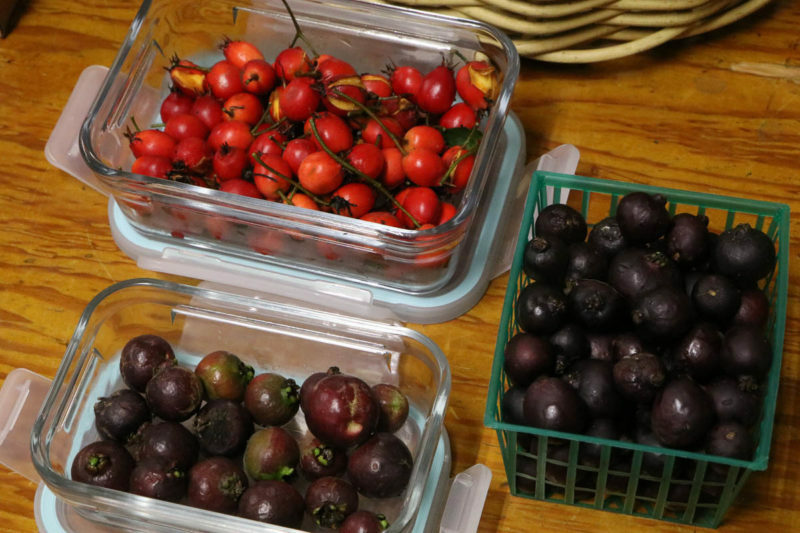 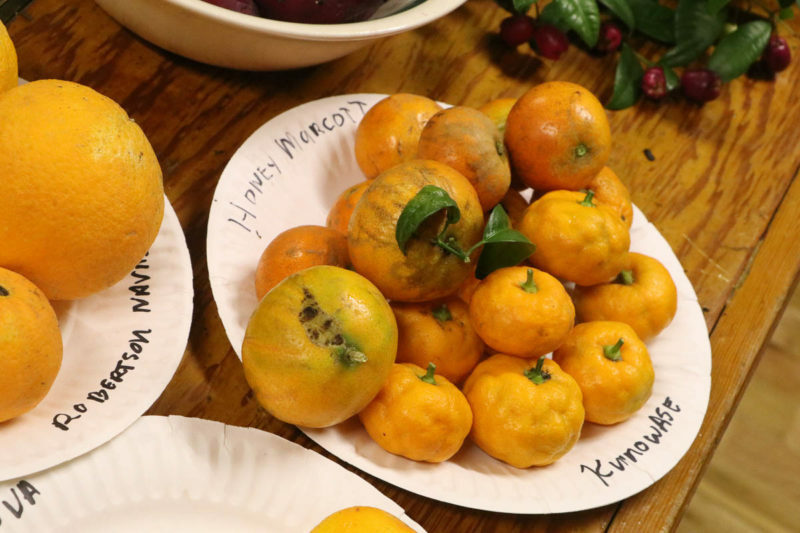 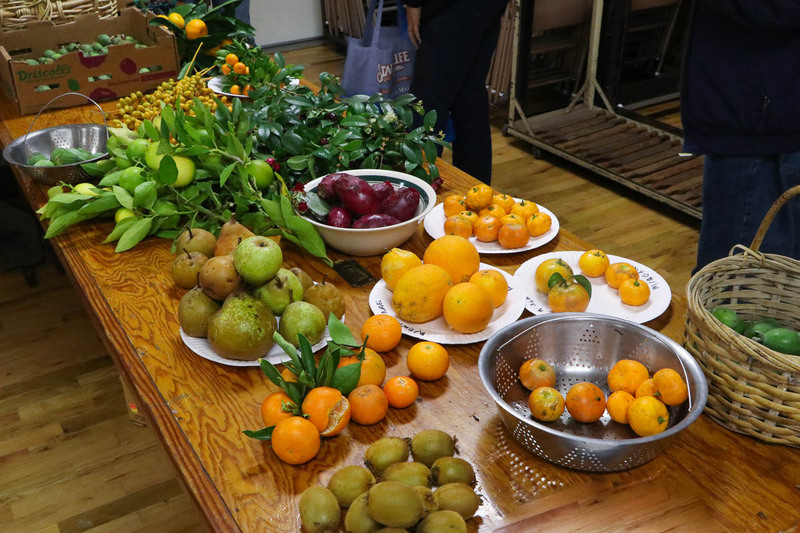 Four crates of persimmons offered up by Nadine Schaeffer of her Birdsong Orchards: Hachiya, Fuyu, Saijo, Izu, Chocolate, Tamopan. 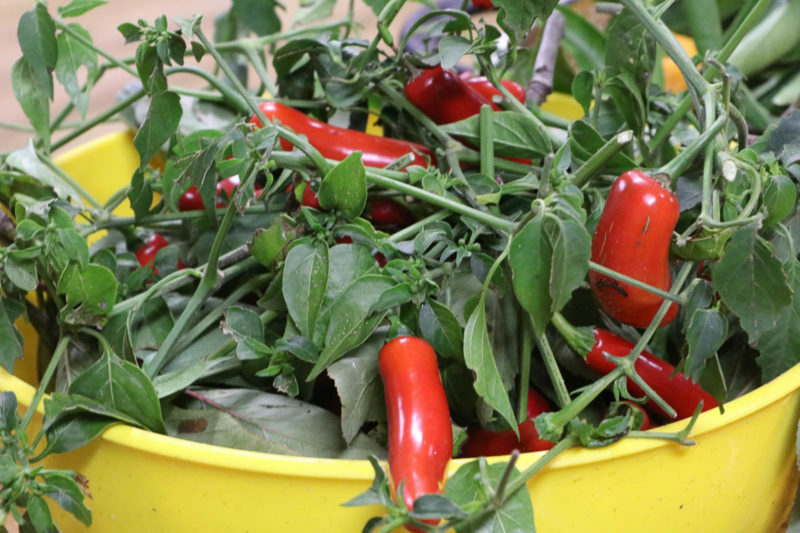 Rocoto or manzano chile (Capsicum pubsecens). 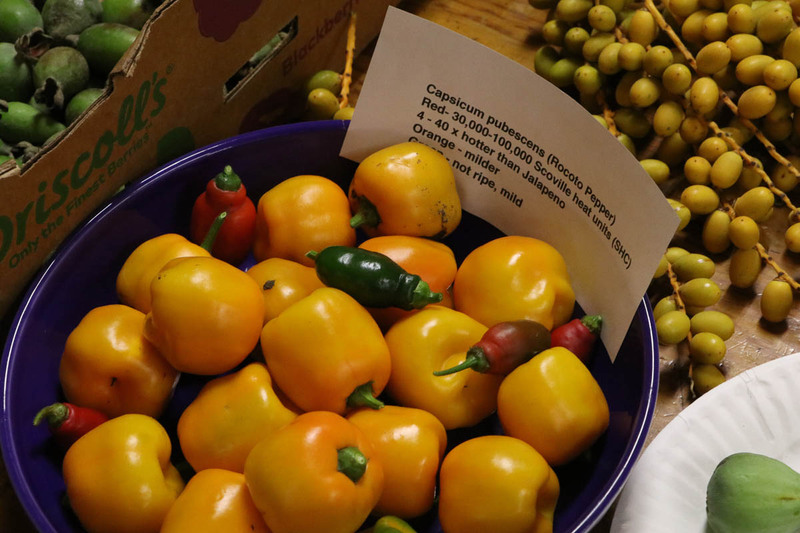 A black-seeded South American chile, somewhat cold-hardier than C. annuum varieties. 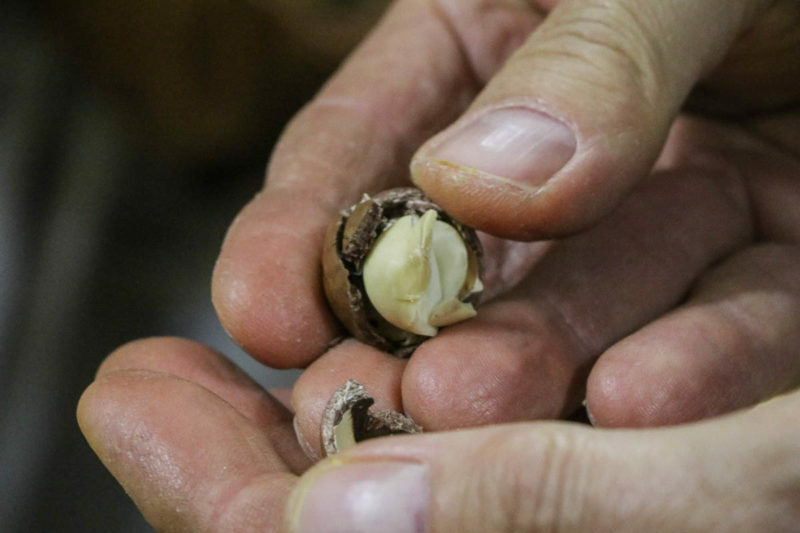 And folks were delighted as ever by Karl Gross’s delicious macadamia nuts, grown just over the hill in the Santa Clara Valley. 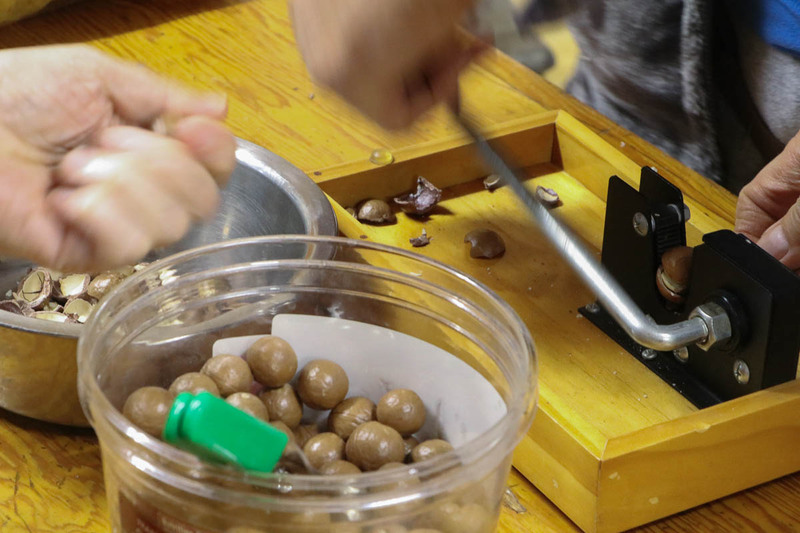 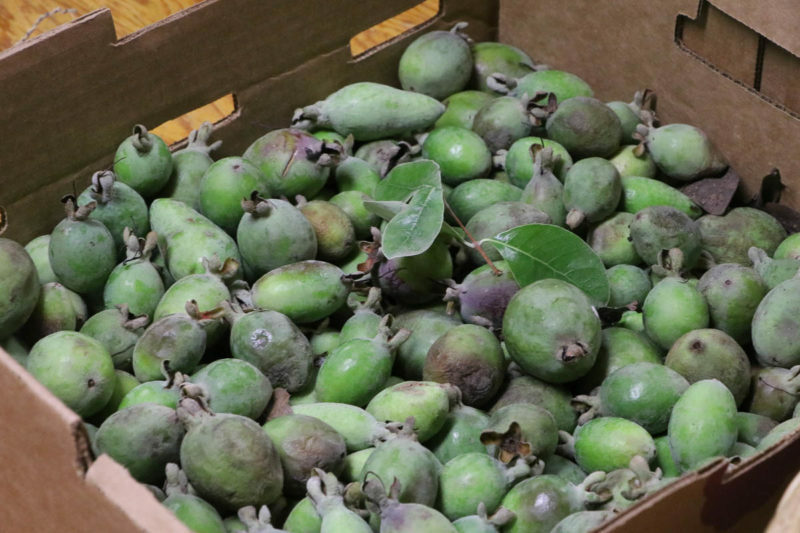 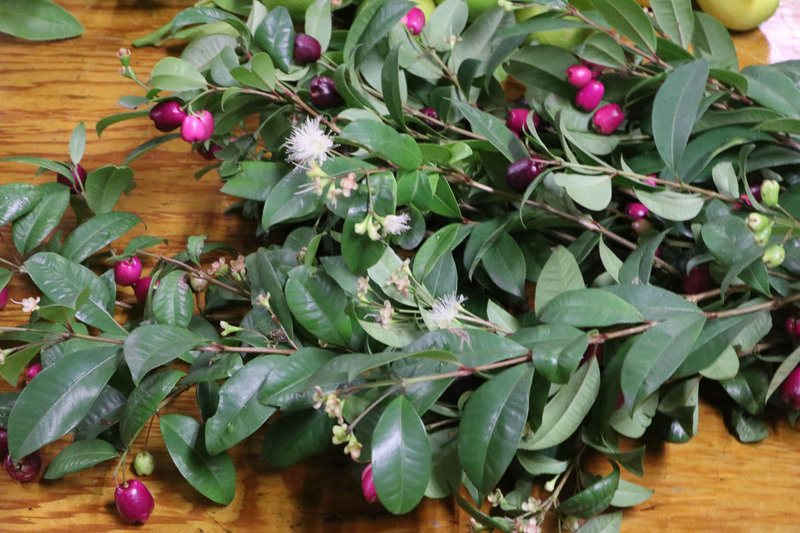 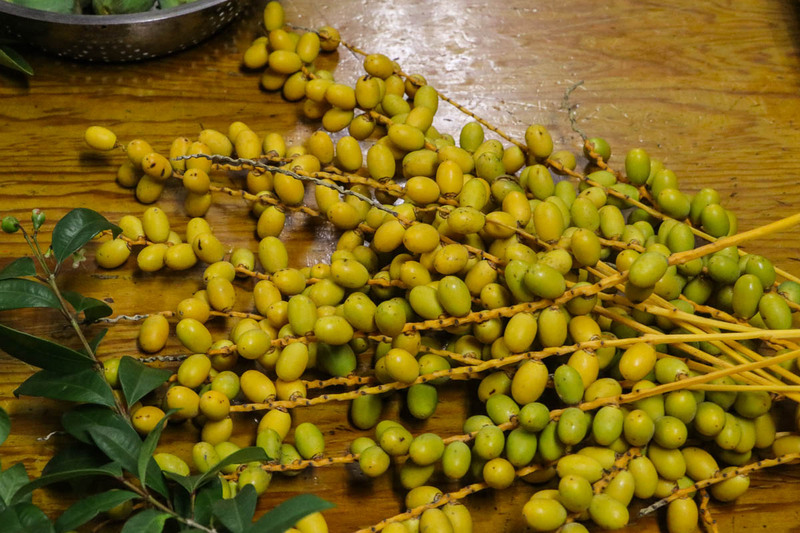 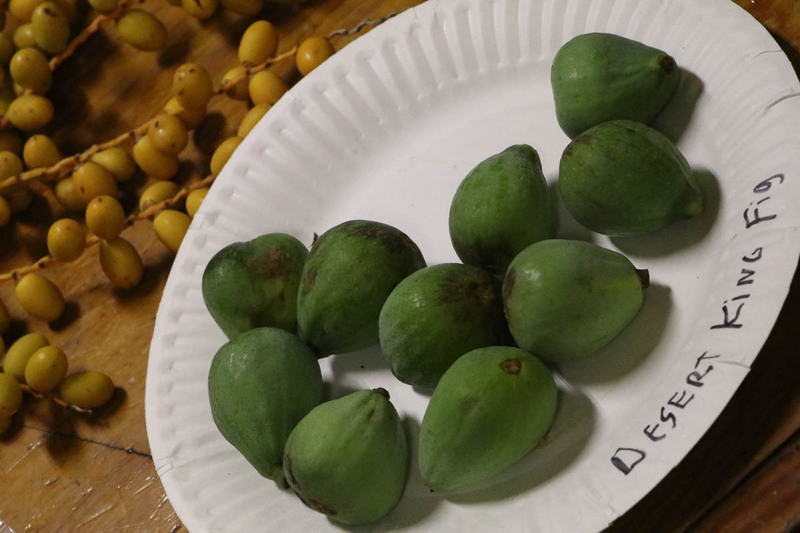 This sparked many conversations about macadamia growing in our more coastal region, where some have seen minor successes, and others have struggled. 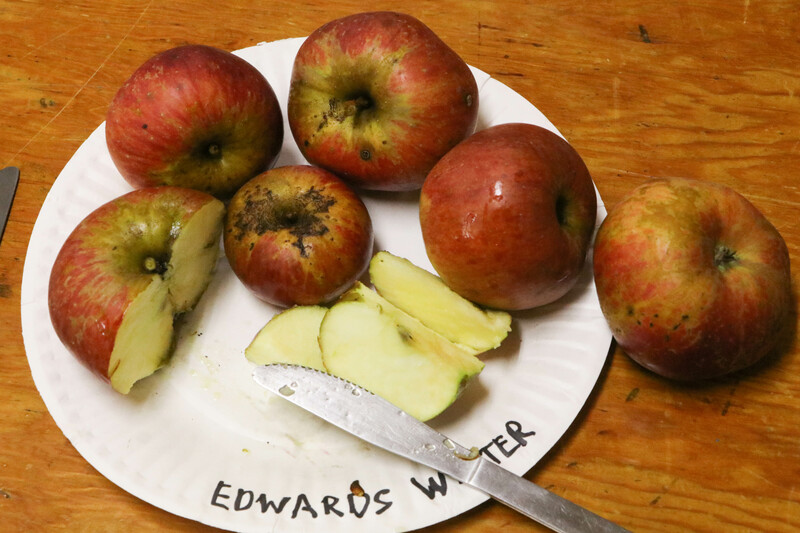 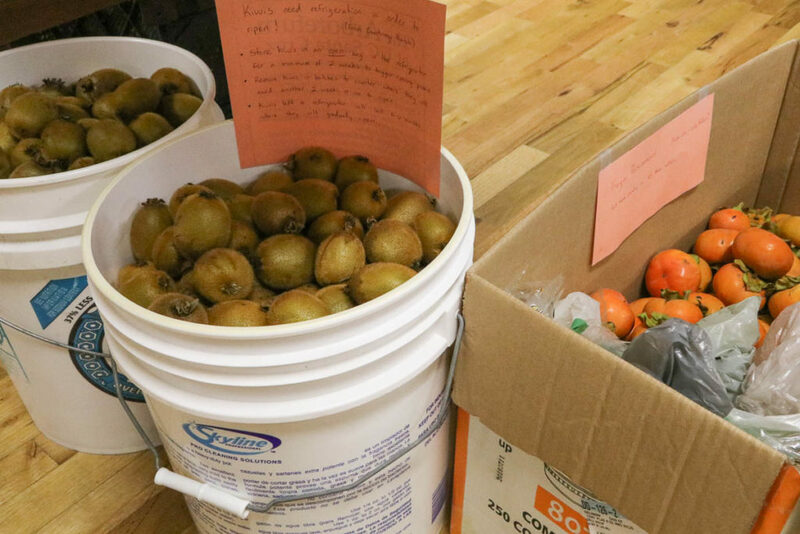 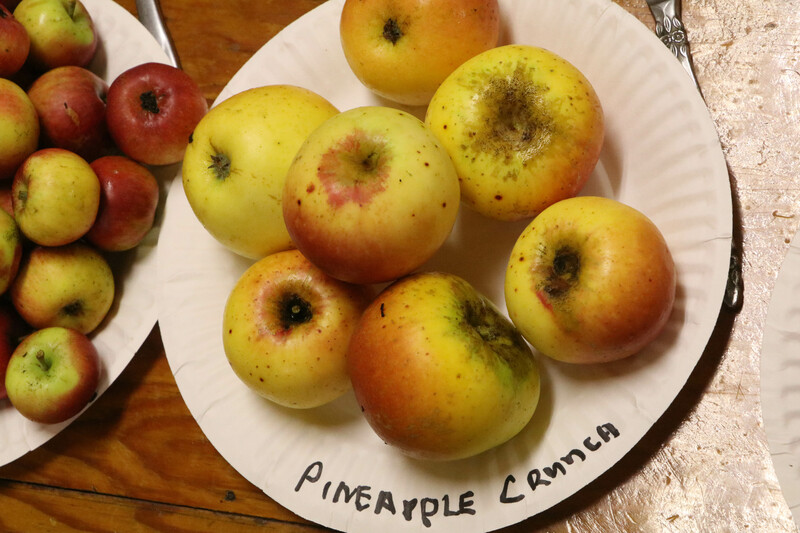 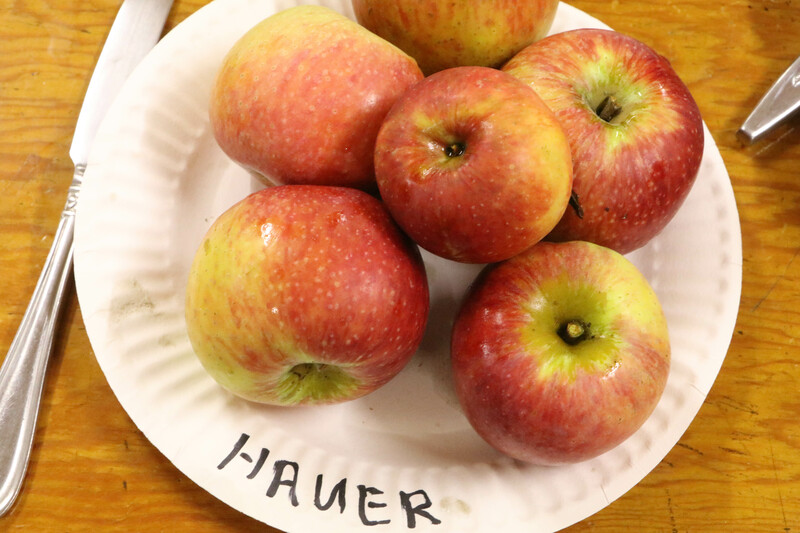 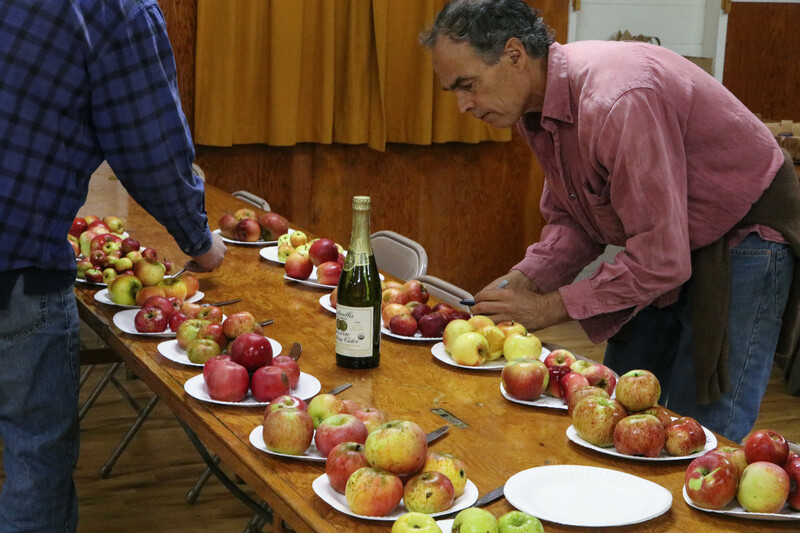 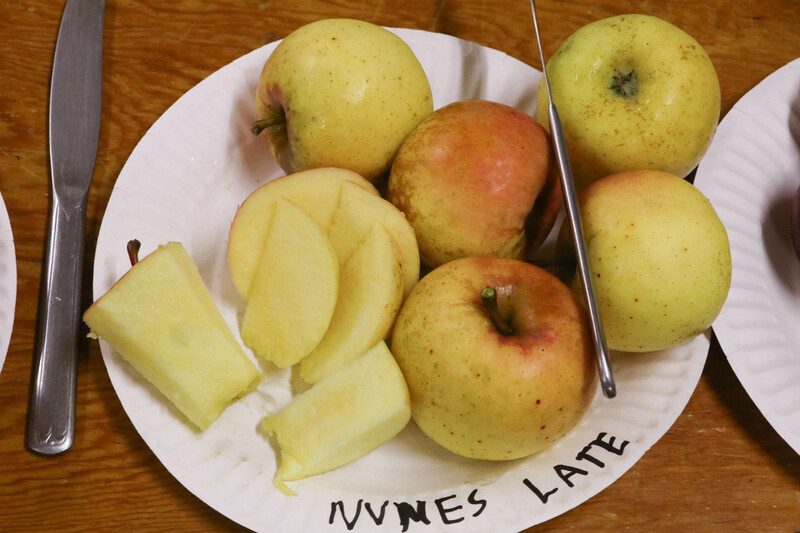 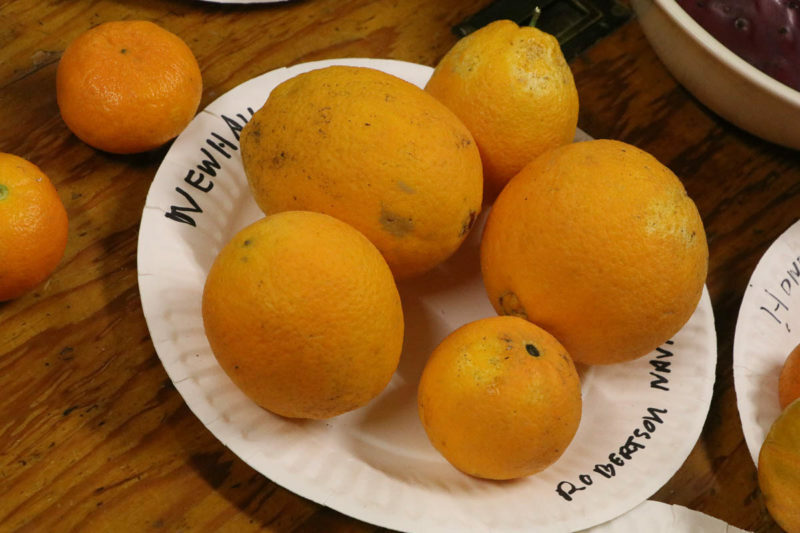 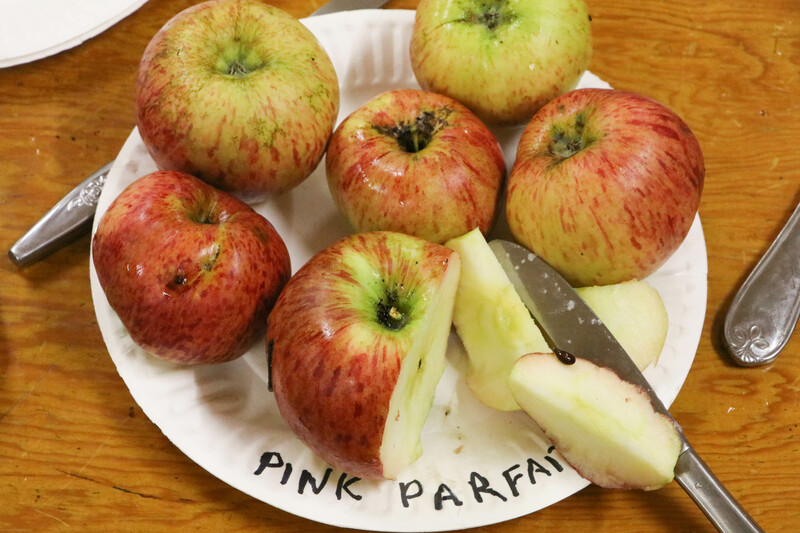 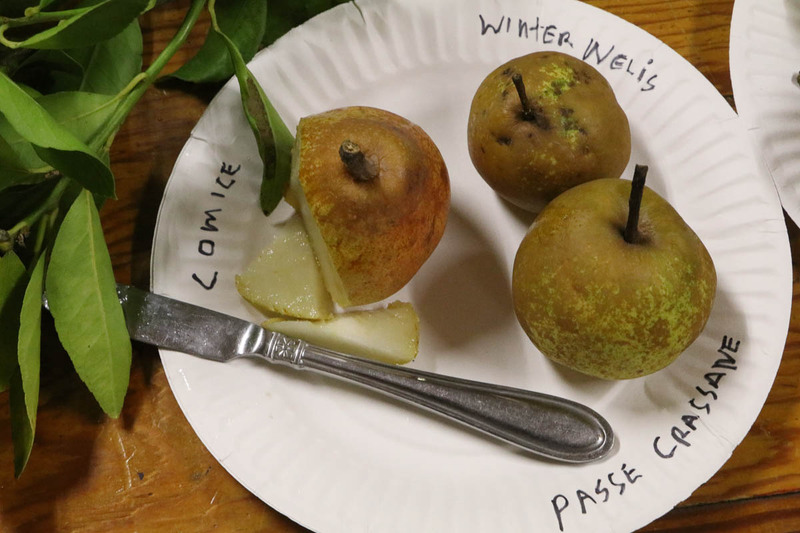 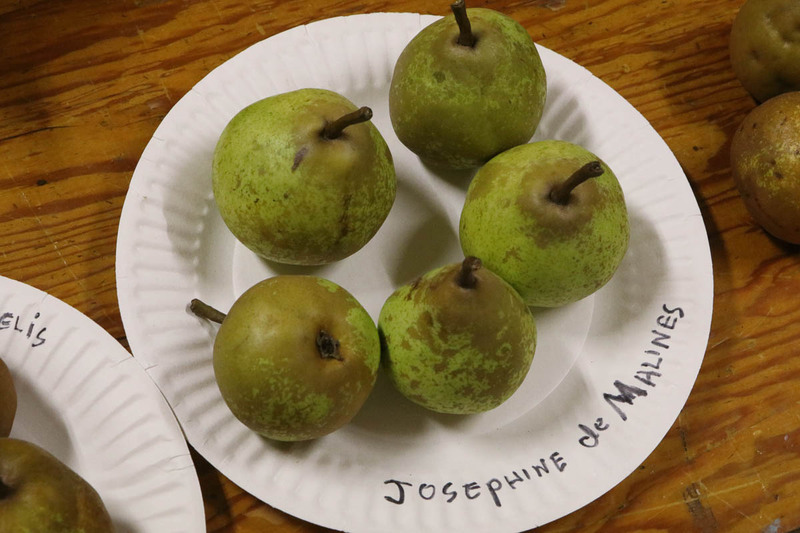 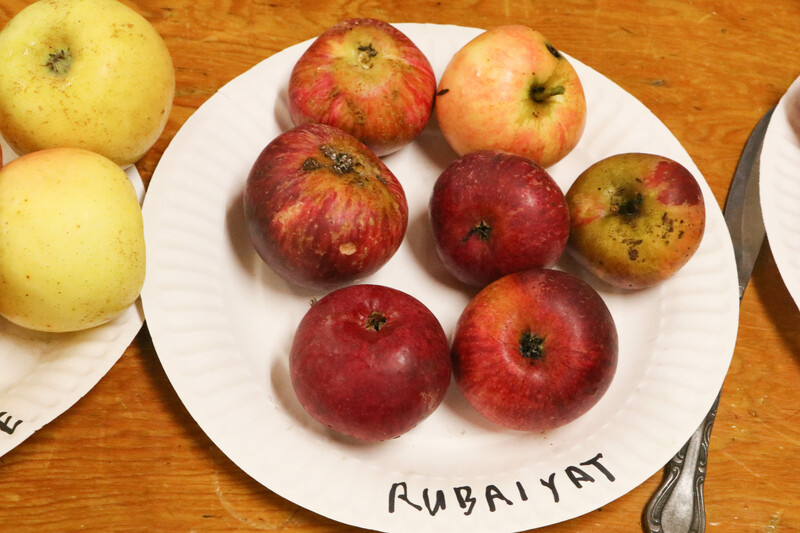 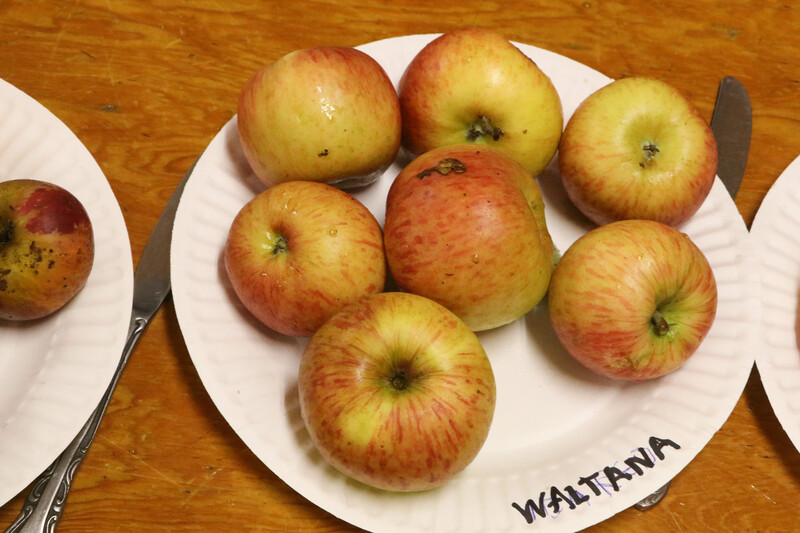 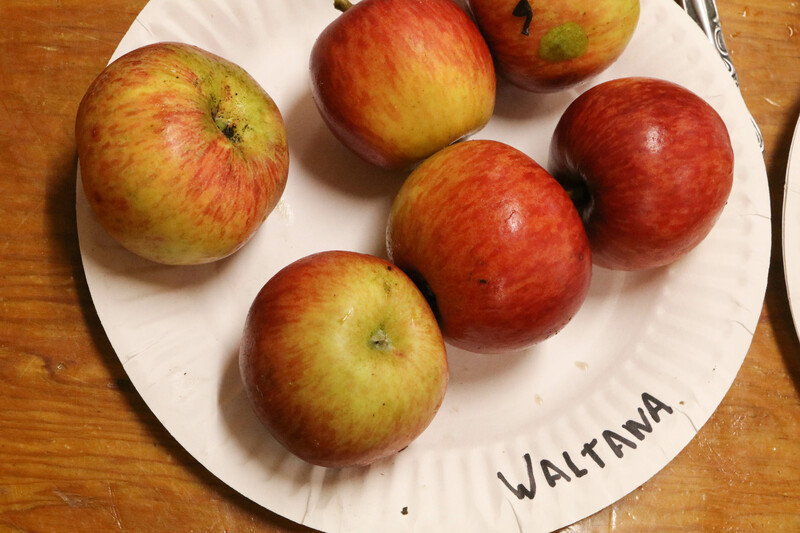 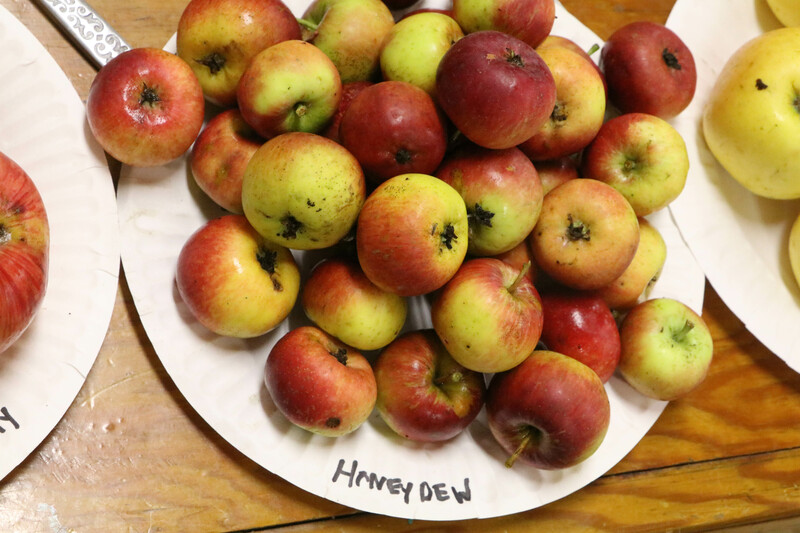 Freddy Menge put together a mini apple tasting from his orchard, to extend our big 77-variety tasting in October at Wilder Ranch State Park. 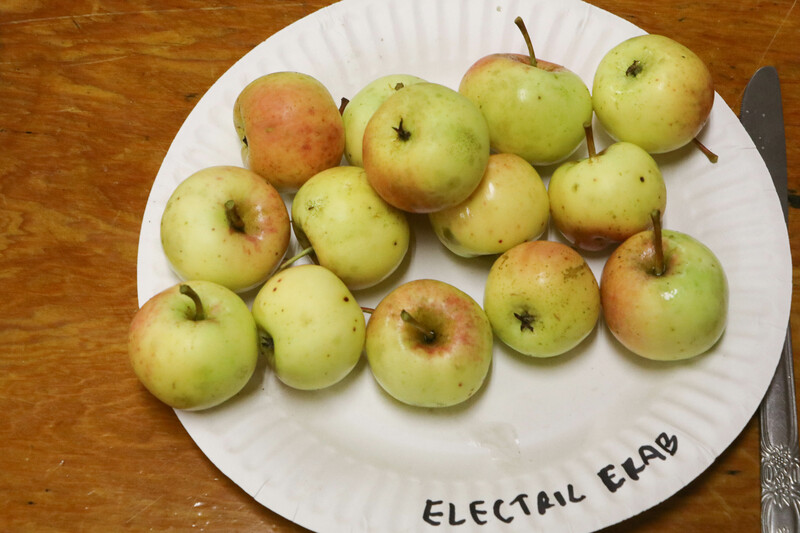 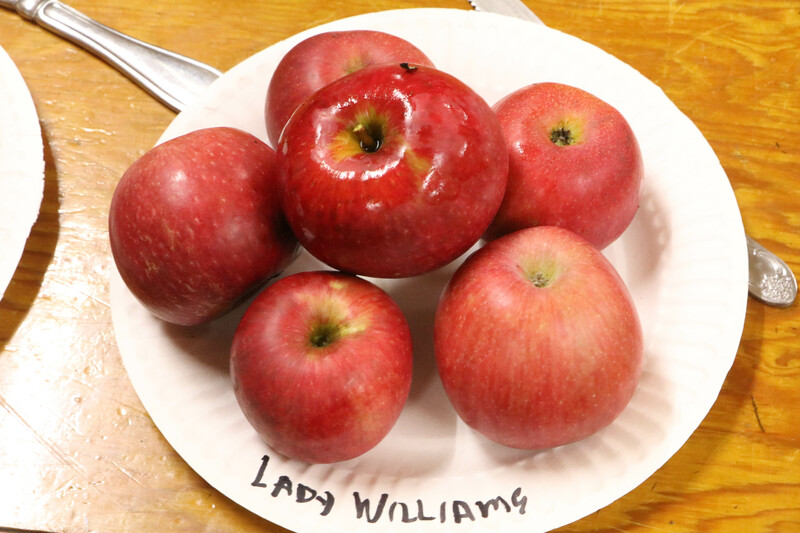 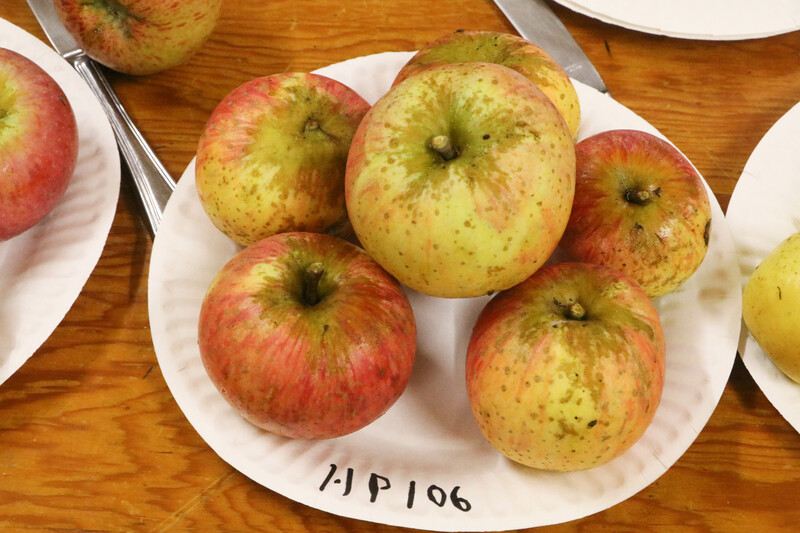 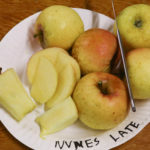 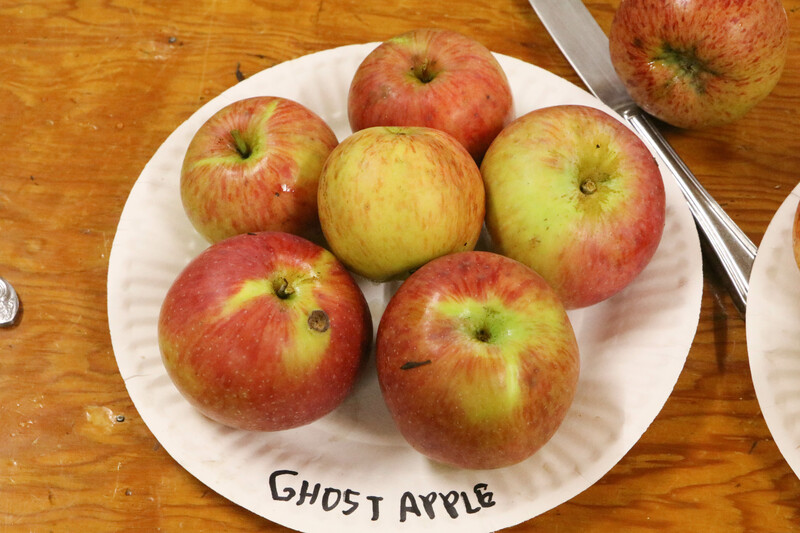 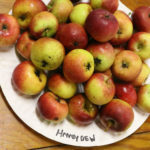 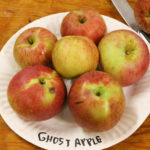 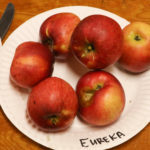 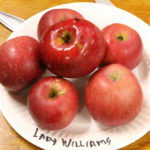 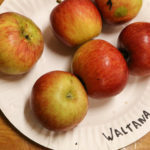 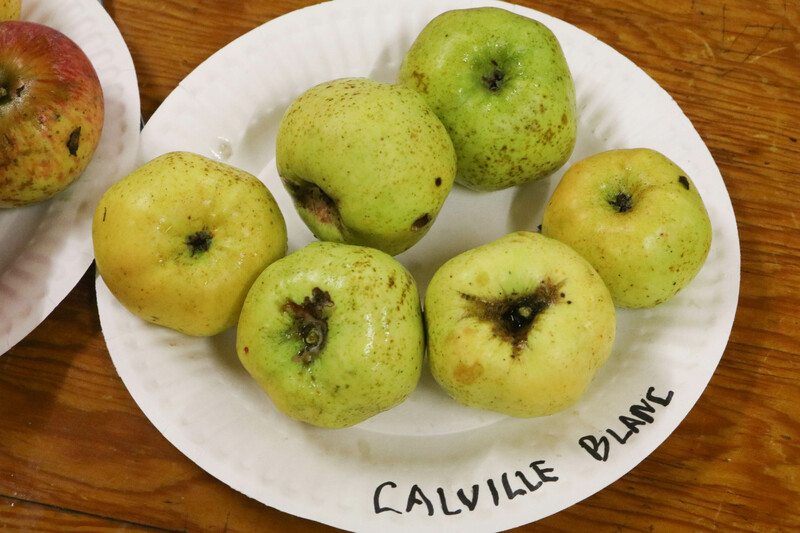 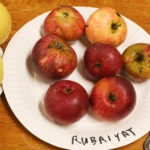 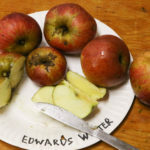 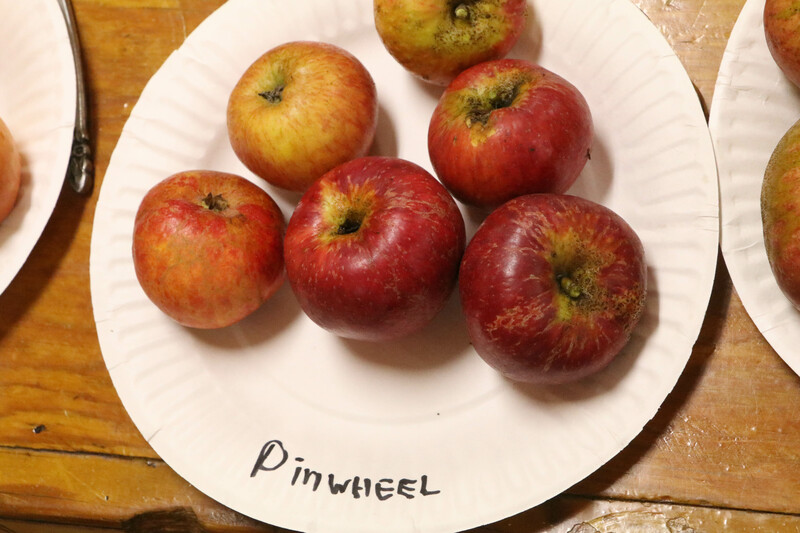 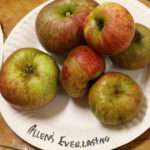 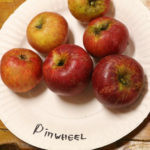 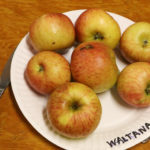 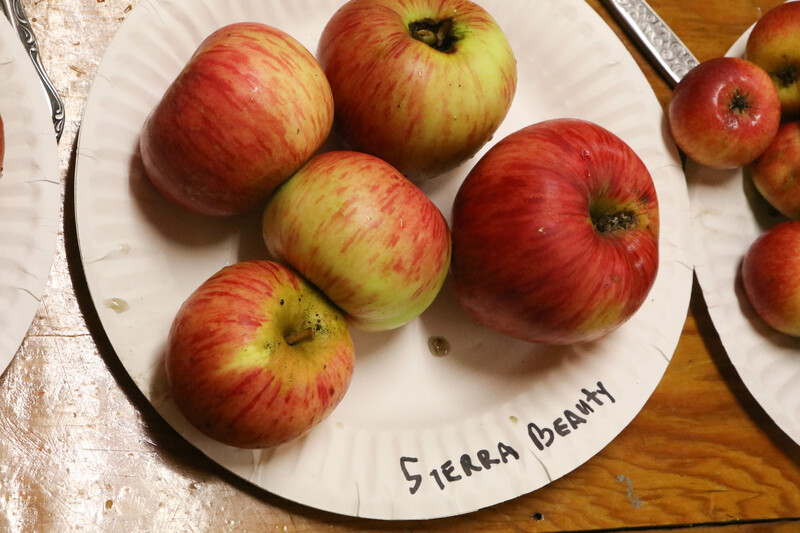 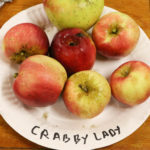 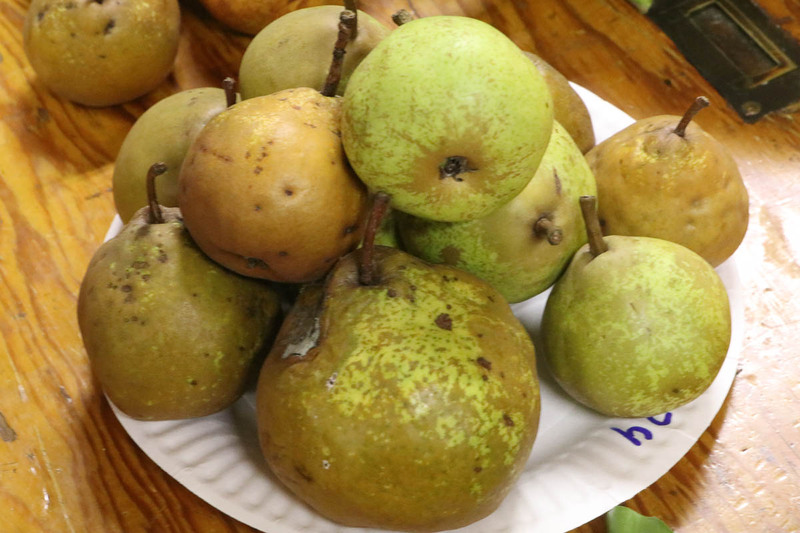 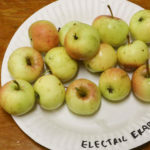 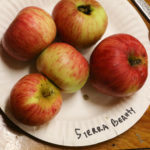 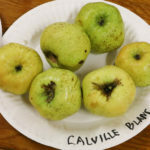 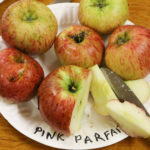 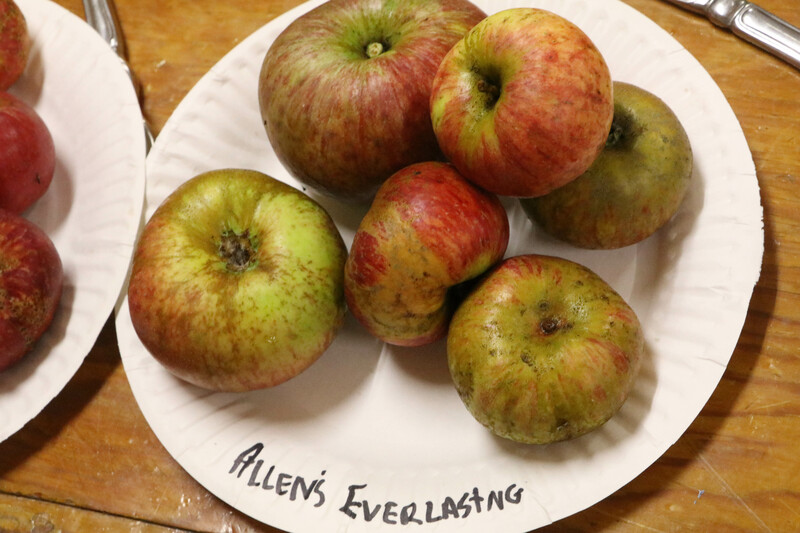 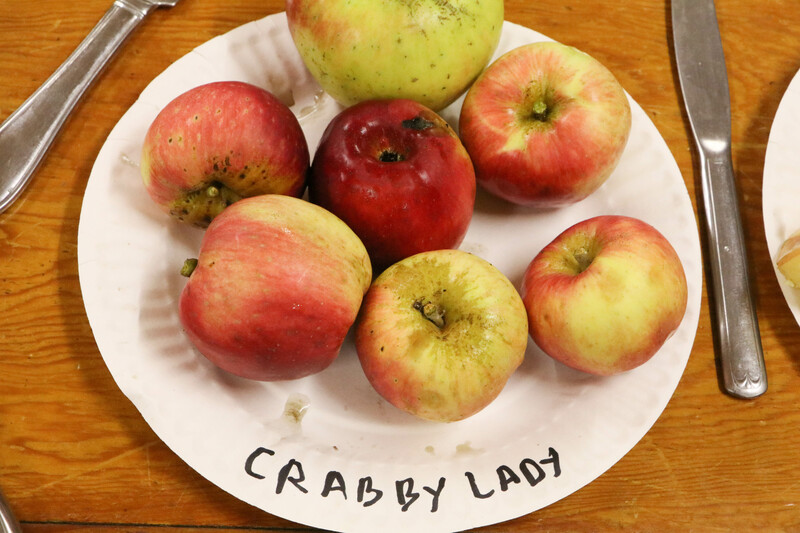 This one featured nineteen later-season varieties, from what’s already been an unusually late year for apples, with many a full month behind schedule. 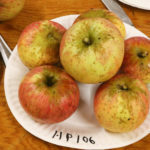 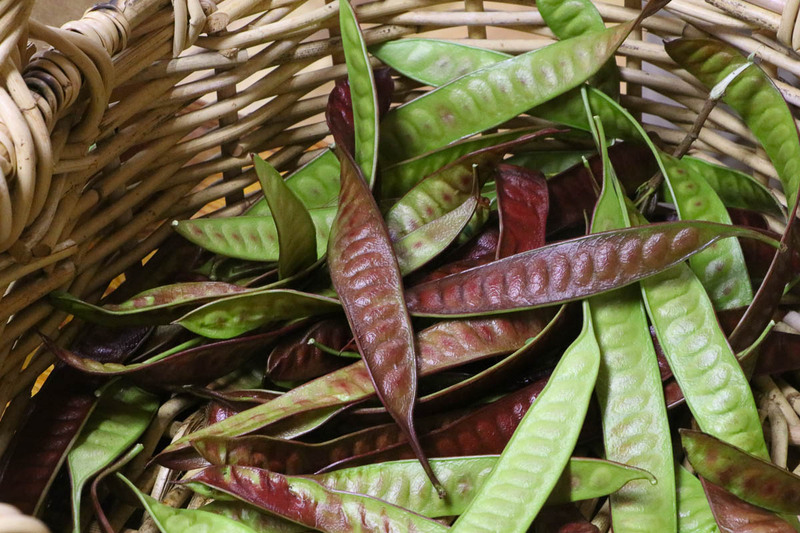 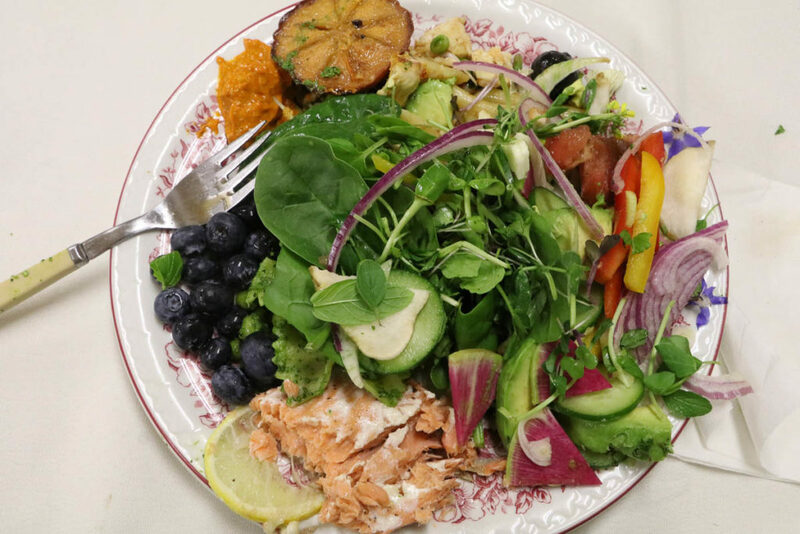 These include a host of heirloom favorites, as well as some of Freddy’s local discoveries and farmstead original seedlings. 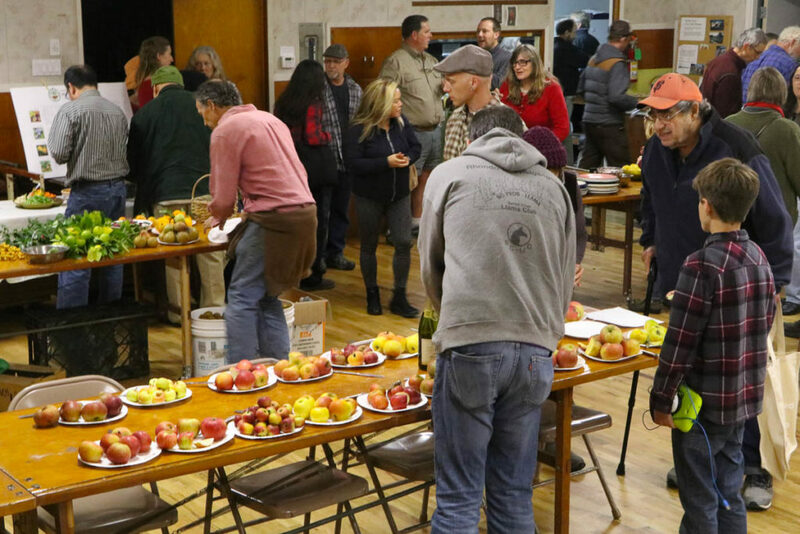 The event was a joyous one with great food, good talk, and some glimpses of the year to come for Monterey Bay CRFG, including a broader slate of meetings, several new community outreach gardening projects, and our increasingly valuable cultivar compendium project. 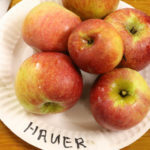 We applauded our chapter officers Chair Michael Kusiak and Vice-Chair Freddy Menge, with tremendous appreciations for their past and future service to the chapter, and we voted in and welcomed our incoming board of officers: Andy Moskowitz (Chair), Nadine Schaeffer (Vice-Chair), Ellen Baker (Treasurer), and Ken Konviser (Secretary). 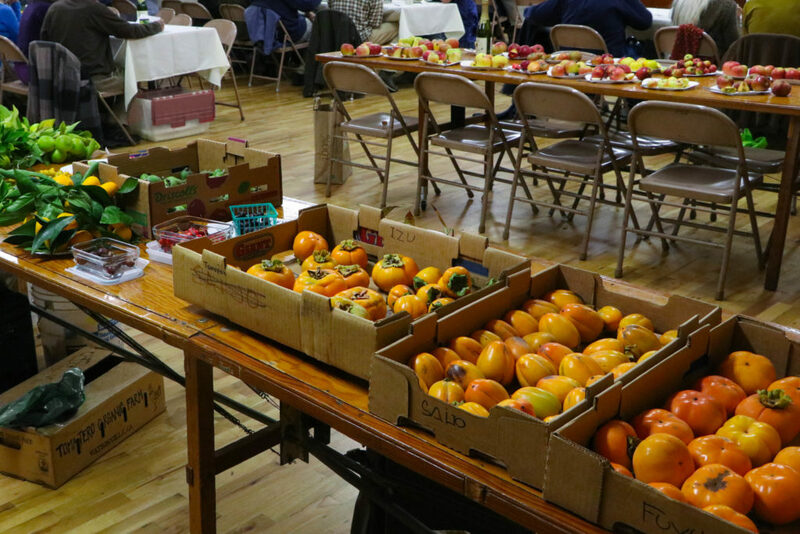 Everyone went home with bellies full, and sacks of fruit. 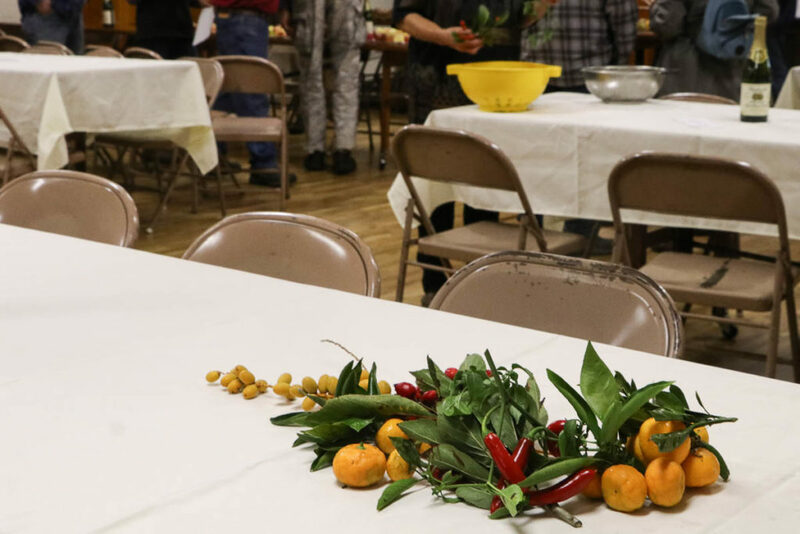 If you haven’t yet, do consider joining the Monterey Bay CRFG for invitations to our next Holiday Potluck and the whole calendar of gatherings and events preceding it. 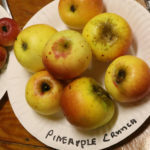 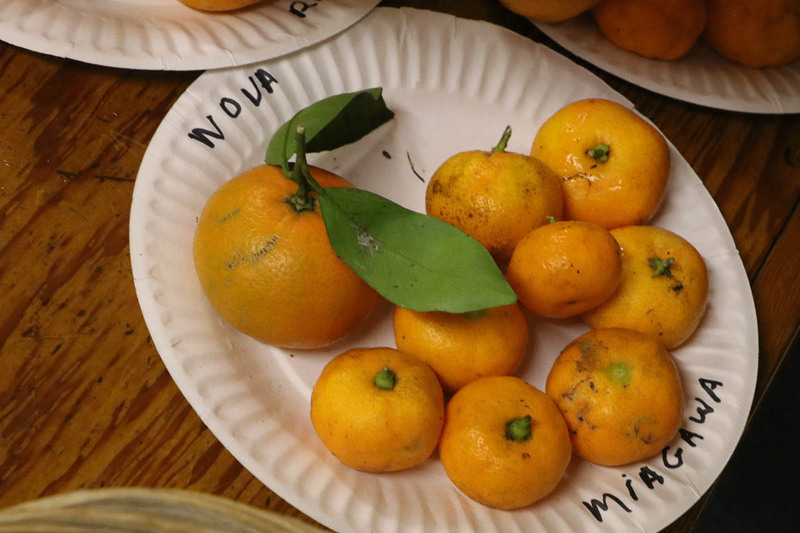 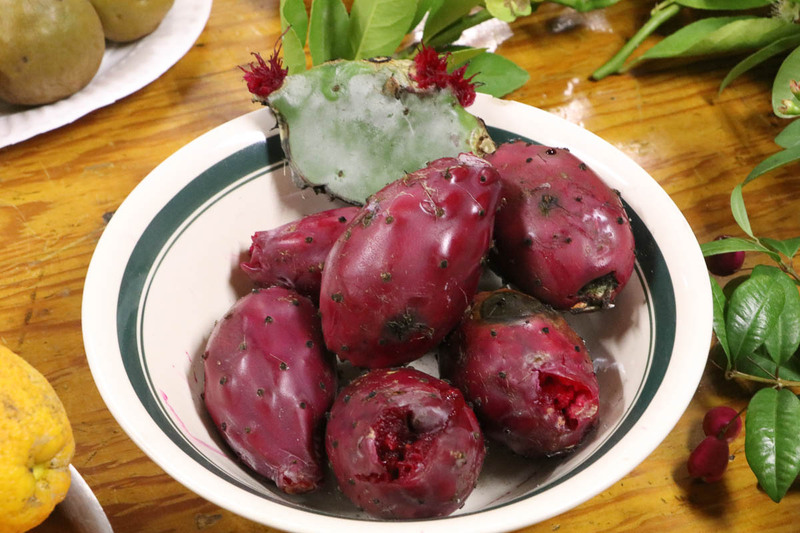 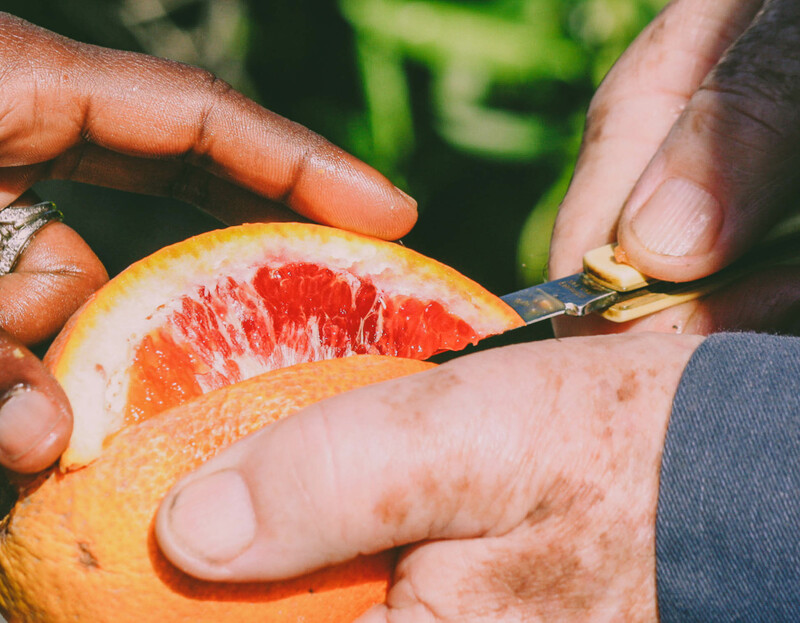 Come deepen your knowledge in fruit growing, or let us show you how to propagate and plant your first tree. 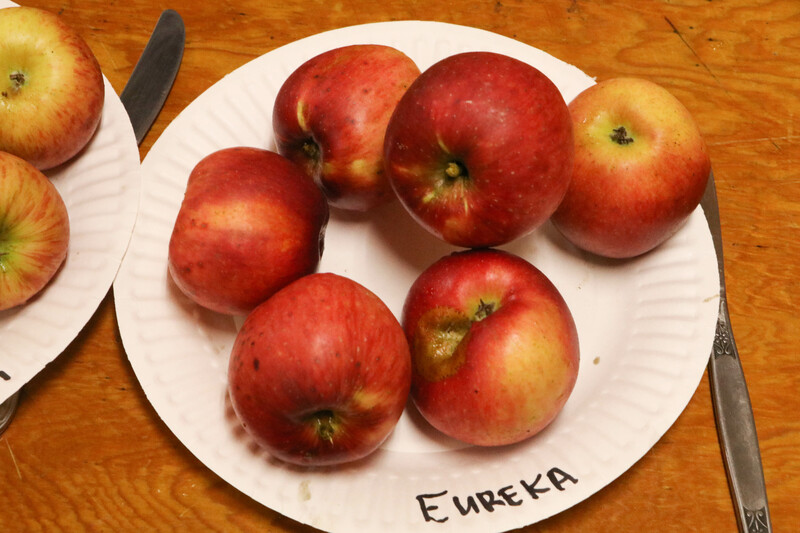 A few of the many tasty garden-fresh potluck contributions, including pies and puddings from our backyard fruit harvests.